Dimensions 0.25 by 5.75 by 8.50 in. Low-fat diet; Recipes; Juvenile literature. Teenagers; Health and hygiene; Juvenile literature. Amazon.com description: Product Description: The YOU phenomenon continues to grow as Dr. Michael Roizen and Dr. Mehmet Oz work to educate readers about health. Now, the YOU docs offer a quick and simple-to-navigate guidebook for teens about the ins and outs of fat, nutrition, exercise, emotions, and all of the important elements that go into devising a weight-loss system. Every stage of life has its share of obstacles. But many folks would argue that the teen yearsâwith all the ups, downs, and in-betweens of freaky friends and freaky and fiery hormonesâcan be more complex than rocket science. In YOU(R) Teen: Losing Weight, Dr. Michael Roizen and Dr. Mehmet Oz offer choices that arenât just simple but are smart ways to control hunger. Thatâs our goal: to teach you how to diet smart, not hard. YOU(R) Teen: Losing Weight has many simple, smart choices for health and fitness that teach readers what works in terms of weight loss and how to create an environment that allows these actions to become fun, sustained, and automatic. Excerpted from YOU: On a Diet and YOU: The Ownerâs Manual for Teens, this book is packed with the strategies and tips that you can employ to lose weight safely and practically. Itâs also loaded with great family-friendly recipes, a sample two-week diet plan, and three family-friendly workouts that will help burn calories and build stronger bodies. 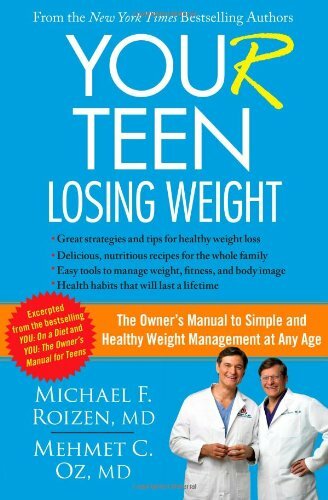 Aimed specifically at some of the health and body issues that directly affect teens, but written for the whole family, YOU(R) Teen: Losing Weight is about learning the best practices for a lifetime of good health. Managing weight and health doesnât have to be a struggle; with the right techniques, you can make it much easier than you ever dreamed! Many of these strategies will work for anyone trying to lose weight; this book can be used as a way to help the whole family make improvements in their health. About: The YOU phenomenon continues to grow as Dr.